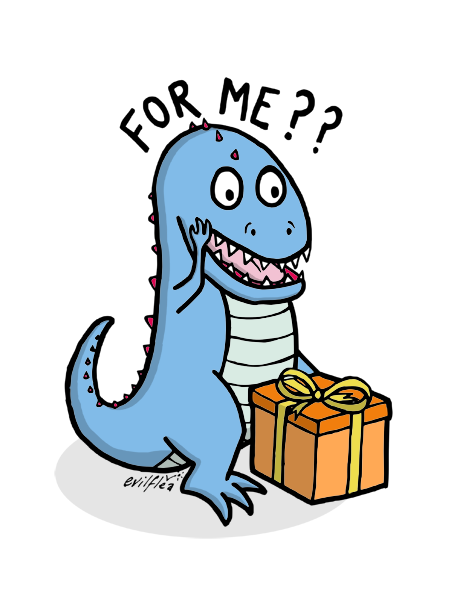 evilflea: Happy Dinosaur: "FOR ME??" Hello! Sorry, I have been extremely busy with Other Things lately - not least moving house - and so haven't been posting here much. That will all change soon, I promise. Recently, my lovely friend Zena of West Art & Glass fame was asked by one of her customers, who needed cheering up, to include a picture of a happy dinosaur in with their order. So Zena asked around to see who would like to draw some. Several of us did, and this is my effort. He's very jolly indeed. I don't think he can believe his luck.